Trying to keep your home or office space a quiet, productive place to work can often mean that you need soundproofing solutions. Noisy neighbors, next door offices, ringing telephones and other outside noise can make a room difficult to work in. In some cases, keeping your clients and your work discreet and focused is also valuable, requiring soundproofing to make your own activity more profitable and pleasant. Don’t be fooled by soundproofing myths though. Not every sound solution is all that it’s cracked up to be! Sound absorption and soundproofing are two different things so don’t be tricked into thinking that devices meant to absorb sound will give you the same results as soundproofing. Both sound absorption solutions and soundproofing have benefits but they achieve a different result. Sound absorption uses sound dampening techniques and materials to improve the sound in a room. This is often used in rooms that need good acoustics, such as a recording studio or theater, or in rooms that are large and echoing to better improve sound and music transfer through the area. Soundproofing, on the other hand, is used to isolate or block sound inside a room – or to keep sound out of a room. This option is often used in business situations where confidentiality or a quiet, calm work environment are prized. Soundproof paint promises to deaden sound, however at 30 to 40 thousandths of an inch thick, it’s ability to do so is very low because the paint is so thin. Soundproof paint promises to absorb mod-range sound waves, offering an inexpensive way to soundproof your room. However, its thinness and lack of absorbing anything on the lower or higher end of the sound spectrum, it is an ineffective choice. Further, this paint comes in only a few colors and is relatively expensive for a material that offers little sound reduction. Soundproof wallpaper is another “thin” layer that promises to provide soundproofing without living up to potential. Typically, this wallpaper is made from an aesthetic wallpaper backed with foam or some other sound deadening material. While this can reduce general noise from room to room in a home, it does not soundproof the room and, again, often fails to block sounds in the high and low frequency ranges like high pitched music or traffic sounds. Soundproof wallpaper is simply not designed for actual soundproofing in a professional office or even a very noisy home. Cellulose insulation is designed to insulate a home or office from heat and cold – not provide soundproofing. While any building insulation will provide a little sound reduction from outside noises, cellulose insulation is no more a soundproofing element than shingles or siding. Further, this option is costly to install and involves actually drilling holes in the walls to blow insulation inside – an expensive and messy option for something that doesn’t work to block sound! Unless you are building a special room in your home, or remodeling for renting, choose your insulation based on heating and cooling needs – not necessarily soundproofing. These foam layers are often used in cardboard packaging or seen as mattress covers. They do not, however, provide soundproofing. This low density foam does little to absorb sound, even in the mid-range. The porous material simply lets sound move through it – a benefit in packing where crushing pressure is cushioned by the space in the material. This feature, however, is a detriment to soundproofing. Don’t be fooled that the ridges and valleys in egg crates look similar to acoustic and soundproofing tiles. This highly flammable material can even be dangerous so avoid it for your soundproofing project. The material used on your mouse pad or yoga mat doesn’t work to soundproof your room either. Soundproofing materials work only in part because of their composition and in part because of their design elements, designed to disrupt and absorb sound waves. Sticking up yoga mats to the wall – no matter the color – will do nothing to soundproof your room. Further, the expense of lining a room in foam rubber could easily yield effective soundproofing solutions that would work much more effectively. These solutions are sneaky as soft surfaces disrupt the flow of sound waves in a room, thereby tricking your ears into thinking that the room is quieter. Curtains and carpeting have a similar affect – which is why an empty room seems more echoing and loud than one with furniture and decor. Carpet and mattresses on the walls, however, do nothing to block incoming or outgoing sound to soundproof a room. Further, they are aesthetically displeasing and would make a poor choice for home decor or an office building that needs a professional atmosphere. Color only affects the eye, not the ear. While the dark colors in your room may look cozy, they do not actually affect the soundproofing of the room in any way. Dark colors fool the eye into thinking a room is smaller, quieter, and more intimate. Visual appearance, however, does not affect the movement of sound in a room. Paint your room whatever color you want but it simply won’t affect the sound quality or soundproofing of the room at all. Many of these “simple tricks” for soundproofing are straight out myths. 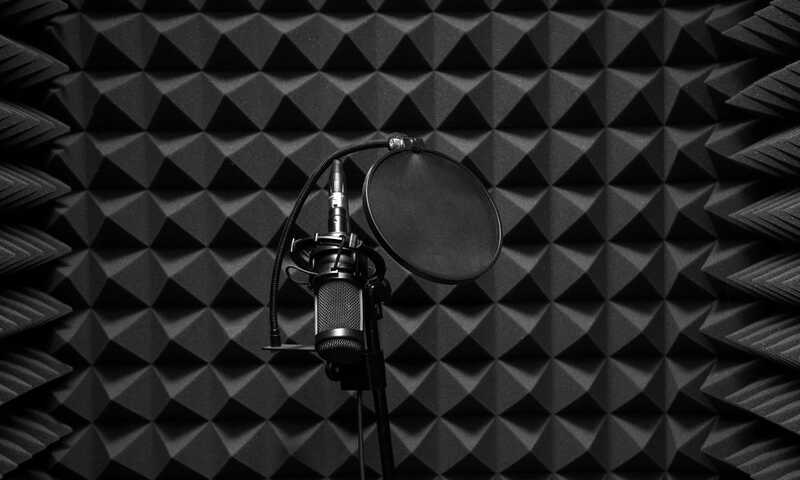 Additionally, by the time you purchase and implement many of these solutions, you could afford to have purchased and installed actual soundproofing equipment for your space. so where’s the list of products that can actually block sounds? what do we put on the walls, then? In my experience paper/cellulose insulation has distinct acoustic qualities over fx. rockwool. There is some truth to these tips, but they grossly exaggerate. Any material that absorbs sound will also block it to some extent, but acoustical panels, mats and drapes will be much more effective if placed on the noisy side of the wall, not that you’ll be likely to convince your inconsiderate neighbors to change their decor for you. As for cellulose, filling an empty wall with ANYTHING will substantially increase its ability to block sound, but the fill should have as much friction as possible (friction converts vibrations to heat) and as much mass as the wall can bear. Moreover, whatever you use, the wall must be packed and the insulation compacted as much as possible, not fluffed up the way it would be for thermal insulation. Of the common insulation materials, mineral wool is considered the best for soundproofing, cellulose is also good, and fiberglass can work, but it really needs to be packed tight. Filling a wall with cat litter or sand will work better than any insulation, but it might not be practical if you ever need to open it up again. But whatever you use, throwing in a few heavy objects (eg. bits of gravel) will make it more effective by increasing both the mass and friction. Just don’t put in so much weight that your house collapses, or use anything combustible that’s not fire rated. The best soundproof walls are double framed or staggered-studded, but a single framed wall can be improved considerably with the right fill. I have not seen faux brick before. If it has some density to it and can be securely glued to the wall, it might help.